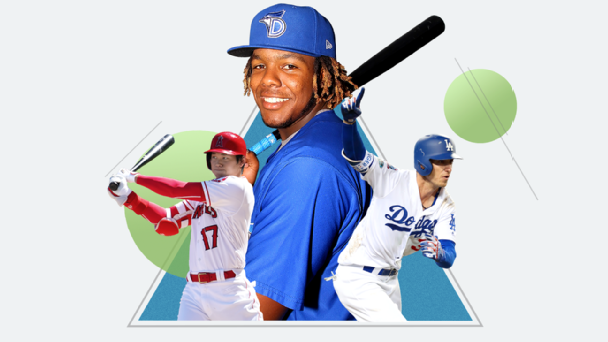 Who will be the best players in major league baseball for the 2019 season? To determine this, ESPN formed a panel of MLB writers, analysts, contributors and Insiders to rank the top 100. We polled almost 50 experts, who voted from a list of just over 200 players. We're starting with Nos. 100-51, which includes 26 new players from last season's top 100. Using some of the leading forecast models publicly available, we've identified one key stat from each player's forecast, as well as some additional info to consider about each player going into the season. His FanGraphs projection for 3.4 fWAR is highest among Pirates position players. Bouncing back from an 80-game suspension for PEDs in 2017, Marte delivered career bests last year in home runs (20) and slugging percentage (.460). The 2019 Bill James Handbook forecasts him for 27 homers after he hit 28 and 27 the previous two years. Conforto has yet to settle in at one outfield position, never starting more than 71 games at any of the three spots in his three full seasons. But last year's second-half breakthrough for an .895 OPS after a slow start cemented his future as an everyday player. Multiple projection systems have Eovaldi starting more than 21 regular-season games for the first time since 2015. Coming back from his second Tommy John surgery, he changed his mix, which transformed Eovaldi from frustrating flamethrower to postseason hero. His new reliance on a cutter (thrown almost a third of the time) helped him deliver a career-best 22.2 percent strikeout rate to complement a career-high 97.2 average fastball velocity. Marcels projects an improved strikeout rate, rising from 7.4 SO/9 to 8.1. Lester has an 11-season streak of making 30 or more starts, but it's a sign of the times -- and the Cubs' commitment to keeping their ace fresh for October -- that last year, he faced his lowest seasonal total of batters during the streak (761). ZiPS projects a repeat of last year's 2.7 fWAR. Following his 2017 breakout (.924 OPS), he fell back to his career norms (.758 last season, .781 career) thanks to an injury-wracked first season in St. Louis. If that big year is how he can still be when healthy, he'll rise up the rankings again. Projection systems expect Osuna to earn more than 30 saves in 2019 after he earned 21 total in 2018 with the Blue Jays and Astros. Osuna's first save in Houston came on Aug. 22. From then on, he had 12 saves to finish off the season, two more than the next-closest players (Jeremy Jeffress, Ken Giles and Felipe Vazquez each had 10). 2018 was the first year in Gennett's career he got more than 600 plate appearances, and he set career highs in hits (181), OBP (.357) and WAR (4.2). He's projected for more than 600 PA in 2019. Gennett hit 23 home runs while playing at second base last season, second-most in MLB to Ozzie Albies (24). Most projections have Puig reaching a career high (currently 28) in home runs in 2019. Since Puig's first season in Los Angeles, he was second on the team among hitters in WAR (18.6). Puig posted a career-best 5.1 WAR in 2014. The last Reds outfielder to post 5 WAR in a season was Jay Bruce in 2013 (5.1), and before that it was Ken Griffey Jr. in 2000 (5.5). After a career-low 10 home runs (in a career-high 138 games), ZiPS has Contreras bouncing back to 14 homers in 2019. In 2016 and 2017, Contreras posted a combined .851 OPS, second only to Gary Sanchez among catchers (.923). Contreras posted a .730 OPS in 2018, 10th among catchers with at least 400 PA, and he's projected to be under .800 in 2019. Freeland's 2.85 ERA in 2018 was a single-season record for a Rockies pitcher who has made at least 30 starts, but projections have his ERA regressing to north of 4.00 in 2019. Freeland was actually worse on the road in 2018, posting a 3.23 ERA compared with a 2.40 ERA at home, which is the best by a Rockies pitcher who has made at least 10 starts at home in franchise history. Steamer and THE BAT have Donaldson projected for more than 500 PA this season; the last time Donaldson had more than 500 PA was in 2016, when he finished fourth in AL MVP voting. Donaldson has four seasons with at least 7 WAR at third base, tied with Hall of Famer Ron Santo for fifth-most all time. The four guys with more all have busts in Cooperstown: Mike Schmidt (9), Eddie Mathews (8), Wade Boggs (6) and George Brett (5). 2018 was the first time in Abreu's career that he hit lower than .290 (.265) and posted a sub-.800 OPS (.798), but every major system except ZiPS expects Abreu to bounce back with an OPS over .800 this season (ZiPS has him at .795). Abreu has three 30-homer seasons in his career, third-most by a player born in Cuba (Rafael Palmeiro has 10, Jose Canseco eight). If he manages to hit 30 this season, he will tie Magglio Ordonez for the third-most 30-homer seasons in White Sox history, trailing only Frank Thomas (8) and Paul Konerko (7). Hicks set a career high with 581 PA last year after never getting more than 400 in any season, but THE BAT projects him for 633 PA in 2019, tied for second-most on the Yankees. Hicks' 27 homers in 2018 were more than he had in his first two seasons in New York combined (23). Before 2018, the Yankees hadn't had a player with 25 homers and 10 steals since Curtis Granderson in 2012 (Didi Gregorius also did it in 2018). The major projection systems expect Olson to hit 30 home runs for the first time in his career. Thanks in large part to some great defense, Olson ranked fourth in WAR among first basemen in 2018, trailing Freddie Freeman, Paul Goldschmidt and Matt Carpenter. The major projection systems have Keuchel's ERA around 3.60, which would be the first time he has posted back-to-back seasons with a 3.00 ERA or worse since he became a full-time starter in 2014. Keuchel's strikeout rate plummeted to 17.5 percent in 2018, 55th out of 58 qualified pitchers and the lowest in any full season in his career. He struck out a career-best 23.7 percent of batters when he won the Cy Young in 2015. The major projection systems expect Iglesias' ERA to rise about a full run from his career-best 2.38 in 2018. Over the past three seasons, Iglesias' 24 saves of more than one inning are the most in the majors (Kenley Jansen 22, Alex Colome 13). The major systems don't think Andujar will match his offensive numbers from last year, with ZiPS forecasting a .786 OPS (down from .855) and 23 home runs (down from 27). Andujar had a .945 OPS in Yankees wins (90 games) and a .709 OPS in Yankees losses (59 games). Steamer, like most other projections, sees Wheeler slipping a bit, with his WAR falling from 4.1 to 2.7. In a 10-start stretch from July 24 to Sept. 12, Wheeler went 7-1 with nine quality starts, 69 strikeouts, 13 walks and a 1.32 ERA. Cano has been nothing if not durable. Other than last season, when he served an 80-game PED suspension, Cano has had at least 634 plate appearances every year since 2007. ZiPS is buying Marquez's stellar second half of last season, forecasting 15 wins (tied for most in the NL) and 3.7 WAR (sixth in the NL). Last season,Marquez became the sixth pitcher since 2014 with half a season of an ERA, FIP and xFIP all below 2.50, as well as a 25 percent SO/BB rate. The others: Clayton Kershaw (three times), Corey Kluber (twice), Chris Sale, Noah Syndergaard and Jose Fernandez. ZiPS expects Grandal to match last season's fWAR of 3.6, which was a career high. Over the past three years, Grandal has averaged 3.0 fWAR and 2.7 bWAR. Last season, Brewers catchers registered 1.1 fWAR (20th in MLB) and -0.9 bWAR (19th). ZiPS, Steamer et al. don't expect quite the production Segura had with Arizona and Seattle, with his WAR dipping below 3.0. He averaged 3.9 fWAR the past three seasons. Only four shortstops have a higher average wRC+ than Segura's 117 over the past three seasons (h/t FanGraphs). Torres showed 20-steal potential in the minors but had only six swipes last year with New York and doesn't project for many more in 2019. As a rookie, Torres was able to rise to the occasion. According to Baseball-Reference.com metrics, Torres had a 1.049 OPS with seven home runs in 103 plate appearances in high-leverage situations. In medium leverage he had an .899 OPS with nine homers in 165 PA, and in low leverage he had a .656 OPS with eight homers in 216 PA. Following back-to-back breakout-type seasons with 3.9 fWAR, ZiPS sees a slight uptick to 4.0 in 2019. Suarez's 48.6 hard-hit percentage last season tied David Peralta for second-best in the majors among batting title qualifiers (Matt Carpenter, 49.0). Did Mikolas capture lightning in a bottle with his 18-4, 2.83 ERA season in 2018? The projection systems think so, with Steamer predicting a 12-11 record with a 4.04 ERA this year. Mikolas led the National League with 186 hits allowed but made up for that with a league-best 1.301 walks per nine innings. ZiPS projects Merrifield to finish second in WAR among AL second basemen. He led the AL in stolen bases in each of the past two seasons -- Merrifield's first two as a regular -- yet he's projected to finish third by ZiPS on his own team this year, behind both Billy Hamilton and Adalberto Mondesi. Restricted this season to hitting, the 2018 AL Rookie of the Year is one of three Angels projected to hit 30 or more home runs by the Bill James Handbook. Remember all those scouting reports that said Ohtani's bat wouldn't be that much of an asset? After Ohtani's 2018 season on the mound effectively ended on June 6 (he made just one more pitching appearance), his OPS was .935 for the remainder of the year. Projected for more than 30 saves by some systems, Hand would set a single-season Indians record for a left-hander (21 by Dave LaRoche in 1976). While notching his third straight 100-strikeout season out of the bullpen, Hand tied for the MLB league lead in hit batsmen among regular relievers last season with nine. He's projected by ZiPS to finish sixth in the AL in wins with 14. Berrios could be coming into his own as a workhorse; last year, in his third time through the opponents' batting order -- a task many starters aren't even being allowed to attempt anymore -- he limited hitters to a .632 OPS. ZiPS, Steamer, Bill James and PECOTA all project a career-worst ERA from MadBum, with none better than 3.74. After two freak-injury-shortened seasons, you might expect a return to full health to mean more durable dominance, but his walk and strikeout rates were both headed the wrong way the past two seasons. ZiPS projects Haniger to finish fifth among AL outfielders in fWAR. As big as his breakout season looks at first glance, it could be even bigger if his home park weren't holding him back. Haniger's OPS on the road last season (.914) ranked sixth in the AL, between Giancarlo Stanton and Jose Ramirez. PECOTA pegs Price for a 4.15 ERA, which would be his worst since his rookie season. Price is coming up on several career milestones, as he should eclipse 150 wins and 2,000 strikeouts this season. He would become the 26th lefty to reach 2,000 K's. The Bill James Handbook projects him for 34 home runs, cracking the AL's top 10. The Blue Jays were likely going to keep him in the minors for the start of the season even before a strained oblique this spring shelved him for three weeks, yet Vlad is the lone rookie to be voted into this year's top 100. PECOTA says he's going to get back to 30 home runs this season. The major projection systems are giving Sanchez something of a break from last year's disappointments, anticipating he'll top all AL catchers in value via WAR, fWAR and WARP. ZiPS thinks he'll follow up last year's breakthrough by posting another 3.0-plus fWAR season. Last year's 4.7 WAR season is a nice reminder of the talent that got Taillon picked between Bryce Harper and Manny Machado as the second overall selection of the 2011 MLB draft; coming back from cancer and Tommy John surgery, he's only just begun proving how valuable that pick was. PECOTA is one of the few projection systems that says he doesn't get the 13 wins he needs to reach 200. The Bill James Handbook puts Greinke's shot at reaching 300 wins at 13 percent. He has averaged more than 15 wins per season the past 10 years, a pace that would get him there in 2025. ZiPS projects him to have the second-best fWAR on the Angels for the third year in a row. Because the glove has been baseball's best for years, it might be easy to forget he has now had back-to-back seasons with an OPS north of .750. Davis has hit .247 in four consecutive seasons. Only ZiPS says he'll make it five in a row. Davis is in the top 10 in home runs in an Oakland A's uniform, and his 133 home runs over the past three seasons is the highest A's three-year total since Jimmie Foxx (1932-34). He's projected for the second-highest tally among catchers in fWAR. If Posey makes a full recovery from the hip surgery that cut short his disappointing 2018 season, we might see a return of power to his bat and a rise back up the rankings. While PECOTA, Bill James and Marcels project fewer than 30 homers, ZiPS forecasts 34. None of these systems sees Bellinger eclipsing the 39 homers he hit as a rookie in 2017, but last year's six defensive runs saved in 50 games in center field suggests he has more than one tool that might vault him back into the top 50. ZiPS projects a ninth consecutive season of 80 or more strikeouts in relief. He's tied with Craig Kimbrel for the longest active streak. Jansen is the lone pitcher with 36 or more saves in each of the past five seasons. ZiPS projects him for better than 14 strikeouts per nine innings, close to his incredible career mark of 14.7. He leads all active pitchers in saves, and a repeat of his 2018 performance would push him into the top 10 all time, even though he won't turn 31 until this summer. Albies is one of only 10 hitters projected to score 100 runs by ZiPS this season, and of that group, all are more experienced except Juan Soto. After hitting 16 home runs across 390 minor league games, Albies reached 16 big league home runs in his 87th big league contest. On a championship team loaded with stars, Bogaerts ranks third behind Mookie Betts and Chris Sale in projected FanGraphs WAR. Bogaerts ranks in the top 10 in hits and doubles over the past four seasons. Betts, Nolan Arenado and Jose Altuve are the only players with more of each in that span. Among those slated to play center field regularly, only Mike Trout boasts a higher FanGraphs WAR projection. He is the lone player in baseball to hit .300 with more than 25 stolen bases four times in the past five seasons. His FanGraphs projection of a .376 wOBA is tied for 12th among all hitters. He led all left-handed hitters in plate appearances vs. left-handed pitchers in '18, but his .817 OPS against them is right near his career mark and strong for a lefty hitter. Already the top base-stealer in the game, ZiPS projects 45 thefts and 19 home runs, figures achieved by a player just once (Jonathan Villar, 2016) since 2012. Turner is the only player in baseball with double-digit home runs and more than 40 stolen bases in each of the past two seasons. ZiPS projects Turner to hit .291 with a .376 OBP, each of which would rank second among third basemen to Jose Ramirez. The 1.066 OPS that Turner posted after the 2018 All-Star break was the third-best mark among qualifiers, after Christian Yelich and Mike Trout. : ZiPS projects Corbin to strike out 195 hitters, placing him just outside the top 10. Corbin finished third among qualified hurlers with a 2.47 FIP in 2018, even besting new teammate Max Scherzer. No projection system would expect a repeat of a historic 0.78 ERA, but FanGraphs still ranks him among the top five closers in expected WAR. Treinen recorded the fourth-best ERA of any reliever in history in 2018, minimum 60 innings pitched.